It’s no coincidence that keno is one of the only casino games you’ll find within the walls of a pub or RSL – it’s the social aspect of the game that makes it so perfect for recreational play. 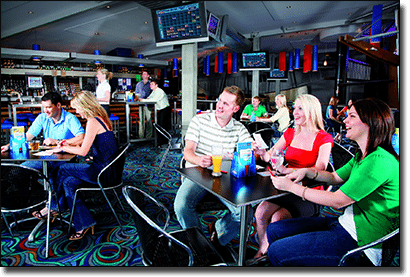 For decades Aussie punters have been drawn to their local pub to down a few pints of beer and catch up with mates over a couple of games of keno, shooting the breeze while also enjoying the thrill of winning real money. But why is keno such a great social game? Why is keno found in pubs while roulette isn’t? We take a look at the reasons why keno makes the perfect game to play with friends. The main reason for the social appeal of keno is that unlike table games like blackjack and poker that require a certain level of concentration and strategy to be used, keno is purely based on chance and requires no more skill than the ability to select your own lucky numbers. This lack of strategy makes keno the ideal game to win some money on a night out without having to remove yourself from the group to go focus on the game at hand. Even the most abysmal multi-taskers can manage selecting their keno picks without leaving their non-gambling mate twiddling their thumbs in the corner. You can also play keno while still maintaining a conversation, unlike playing the pokies in a land based venue where the noise is often overbearing and the draw of the flashing lights and spinning reels is too distracting. In the same vein that table games are fun to play at a casino, general chit chat around the tables is frowned upon so that serious players can focus on their next move without distraction, while pub keno allows you to gabber on as much as you like. One of the biggest social benefits of playing keno in a land based venue is the chance to revel in your success if you’re lucky enough to land a big win. What’s greater than that sweet moment where you see your chosen numbers being hit as you rack up a hefty cash prize and you’re able to turn to your mates and shout a round of drinks in celebration? In 2013, a NSW man won $4.36 million at his local pub in Lambton and he said he wasn’t going to waste his money on cars or fancy holidays, just plenty more cold beers with his mates, which is exactly the social nature that keno embodies. Can online keno be a social game? Obviously playing keno online removes a certain aspect of social play, but it doesn’t have to eliminate the social element completely. Most of the keno games you’ll find at our recommended casinos are single player games, but there is a great alternative – live dealer keno. Live dealer keno is the clear choice for punters who want to enjoy the convenience of playing keno online while still enjoying the social elements of the game. During live dealer keno games you have the option of using the live chat function so you can converse with other players and even communicate with the dealer while you play keno for real money. Games are hosted by real human croupiers in real time and streamed direct to your computer using high-def video. The best part is that no one can see you, so you can still play keno and socialise without having to make yourself presentable, which gives online keno a leg-up over pub keno in our books. New online keno games are being released regularly, so we have our fingers crossed that multi-player keno will soon become widely available for virtual play so you can chat directly with your friends while playing keno from your computer, laptop or smartphone. Until that day comes, head to G’day Casino to try live dealer keno for real money bets in AUD. On the other hand, if you’re not a social person online keno offers the ideal platform for you to enjoy your favourite game in peace without having to interact with anyone else if you don’t wish to. Simply go to any of our recommended keno sites and log in to play one of the RNG (random number generated) keno variants without any interference from other players.